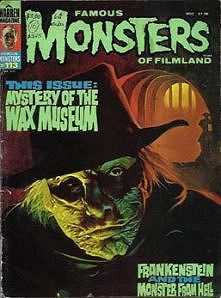 January 1975 issue of FM with cover featuring Lionel Atwill from the "Mystery of the Wax Museum". There is some writing in ink inside the "M" on the cover and on the contents page. This film was one of the first color movies and also featured Fay (King Kong) Wray as the heroine. The wax figure did not hold up under the intense lights on the set, so live actors were used instead. Website design and hosting by Sohodojo Business Services. Item 111 of 466 items displayed in viewer. 0 items in cart.